The Heirloom is an absolute masterpiece! This Titanium Bi-Metal is the second highly anticipated release from YoYoBrothers, while their first release, the Heritage, sold out quickly here at YoYoExpert. The Heirloom is the Signature YoYo of Team Member Evan Gronberg. Evan wanted a yoyo that would mirror his fast paced style and be able to hang with both his fast and slow flowing movements, while still maintaining 100% complete control of the yoyo at all times! The simply magnificent Heirloom is design sorcery, with pure lines and seamlessly integrated stainless steel weight rings. The Heirloom will have you quite confused between the way it feels before throwing and what happens as soon as you throw it! It has a sweet spot that feels like a chill throw but plays like a monster. The Heirloom is capable of handling any type of play at any speed, very stable, and is super maneuverable. Just amazing!!! The Heirloom will be your new go-to throw whether your looking for a chill throw on the weekend, or a competition monster at your complete control on stage. There are only 30 individually numbered Heirloom worldwide, and come in a stunning and uniquely attractive custom engraved YoYoBrothers Heirloom wood box. All Heirloom ship with a limited edition SpoolThreadCo x YoYoBrothers custom string on a spool! 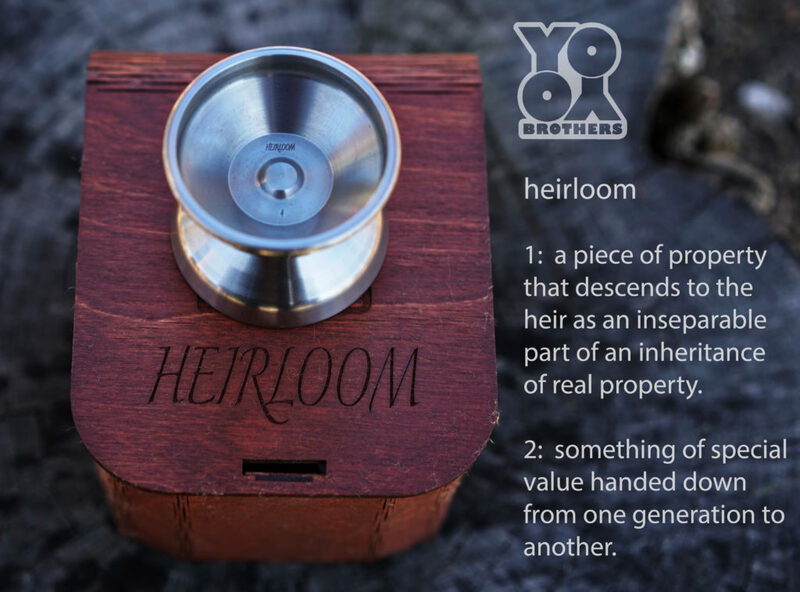 The Heirloom is engraved YOYOBROTHERS on one side, and HEIRLOOM and small engraved Number (1-30) on the other. Only 30 numbered units are being released worldwide. From YoYoBrothers inception, their goal has always been greatness. It is ingrained into everything they have been and everything they have become. Since their first release, the Heritage, they have been dedicated to pushing the boundaries of yoyo. Visionaries who refused to say no, from the yoyo to the end of the string, YoYoBrothers are dedicated to a dream that is shared by every thrower on the planet. If you were able to pick up their first release, the Heritage, then you know the quality and precision that awaits you. If you missed out on the Heritage, then you surely won’t want to let this one pass you buy. You owe it to yourself to own this limited piece of YoYo History that is not only a competition beast on the end of the string, but sure to be a collector’s item.